Col. al-Asaad is the man who defected from the Syrian Air Force in mid-2011 to found and then command the Free Syrian Army (FSA). On March 25, he lost a leg in his booby-trapped car in al-Mayadeen, near Deir Ezzor. I must begin this article by admitting I considered Col. Al-Asaad to be a stumbling block to the FSA’s evolvement and unity. 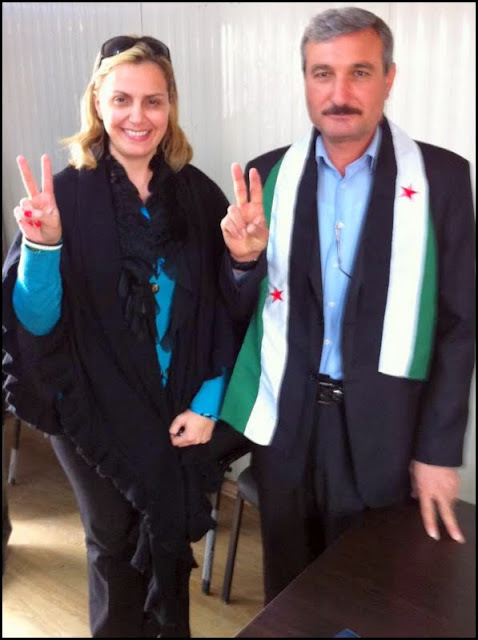 I thought he was self-centered and wanted to remain at the FSA’s helm despite lacking the military qualifications. I never shared my opinion of Col. al-Asaad with anyone. But each time his name was mentioned, my bad impressions of him would flood back to my mind. Worse still, I used to think he was being manipulated by external intelligence services -- whether regional or Arab -- and that he was fronting for meddlers in Syrian affairs, if only to sustain “his” army. I was apprised that efforts to wrest the FSA from the colonel’s grip were always being frustrated by his maneuvering ability and by the appreciable inroads he made in the FSA. My overall impression of the man, in other words, was totally negative. I thought he epitomized corruption in the military echelon such as you would find in the political echelon of the Syrian National Council and Syrian Opposition Coalition. Suddenly, the fighting forces within and outwith the FSA were restructured and Col. Al-Asaad was removed from his command of the opposition army and totally sidelined. What was the man’s reaction? And how did he prove his true mettle? Col. al-Assad swiftly disproved the idea he was an egocentric and self-serving FSA commander. Once sidelined, he did not bump heads with anyone. He did not disparage a soul. He did not form a caucus to fight his corner and help him recoup his lost authority. He did not contact a single politician or officer to complain or bemoan his bad luck. Once removed, he accepted to step down from the helm and simply sped to the battlefield, where he proved himself to be a proud and honorable nationalist for whom public interest supersedes self-interest. The man stepped down and enrolled as an unknown and nameless soldier in the battle for freedom. We started hearing his news on occasion. We would hear he was in the Idlib countryside, then in Aleppo, then in the countryside of Hama and later in Hama city proper. Last we heard was an attempt on his life. The Assad regime was bent on getting rid of him, even after he became an anonymous foot soldier in the resistance army. Col. al-Asaad’s comportment and actions proved me and his other doubters wrong when he turned his back on preeminence and a command and control position to join the people’s fight for liberty and democracy. The leg Col. al-Asaad lost crowns him leader of his country’s freedom fighters.